You could always power ballad your way through the 1984 Foreigner song "I Want To Know What Love Is," but Daniel Pierce might give you a more scientific reason behind the question of what makes people find that deep personal attraction, connection or feeling. 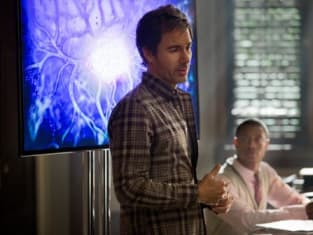 "Alienation" was a far more interesting and focused episode of Perception than the premiere, "Ch-Ch-Changes." It tackled the universal concept of love with a unique neurological disorder, while allowing for some good character moments that pertained to the theme of the hour was both charming and entertaining. And there were Star Wars references. Daniel is such a fascinating character, intelligent beyond those that surround him, and yet he struggles with his flaws, his desires and everyday life... just like anybody else. Granted, watching him try and juggle Natalie and Caroline was funny and a little sad as well. It's easy to want everything to work out for him, but you can't really have a relationship with both women especially if one is a hallucination. Doesn't matter how attractive both versions are. It was a perfectly awkward moment when Kate Moretti started asking questions about Daniel's "therapist." Jealous, perhaps? I'm glad that Kate's ex is around to add another layer to her character, not so much to just be antagonistic in general, but to explore a side to Kate that we haven't gotten to uncover yet. I don't think their feelings for each other are completely gone even though she did sign the divorce papers. She could have said "no" to visiting Donnie's grandmother, for sure. Although, it was nice to see her out of her FBI clothes and a little more casual. As for the case itself, I don't know if it was because of the whole alien theme or that the disorder involved was intriguing, but I was interested to know how it would all turn out. Unfortunately, there wasn't a cure for the woman (and a dead body), yet her delusions of extraterrestrial beings based off a brain connection to love wasn't discovered because a hallucination was pointing its finger or shouting out the exact answer. Instead, it was good to see Daniel come to his own conclusions with the hallucination more so being a nuisance while he was thinking. A funny "alien" nuisance at that. And I liked the whole Comic-Con style convention complete with a Lando Calrissian costumed Lewicki, and a Darth Vader sending Daniel to hide in a corner. I wished Kate might have said something to the Stormtroopers that was like a line from the Star Wars movie ("Aren't you a little short for a Stormtrooper? "), but it was good they weren't knock-off characters meant to simply represent Star Wars. It was even humorous that Daniel was compared to Dr. Who based off his wardrobe, complete with scarf. Overall, it was nice to see Daniel have to deal with the repercussions of going off his medication. On the one hand, he brilliantly can figure out the complex cases like a pro. On the other, his personal life is filled with Daniel clutching his briefcase and trying to keep everything together. Can he ever do that? And does letting Caroline walk away mean those two are done for good? Can he actually only have a relationship with Natalie? Can he keep everything okay while off the medication? I was far more invested in both the case and the characters this go around, and was pleased to feel like the show was digging into its most positive aspects and allowing them to shine from beginning to end. I may have had my doubts with the Perception Season 2 premiere, but after the second episode, I'm looking forward to seeing Daniel Pierce and company back next week.